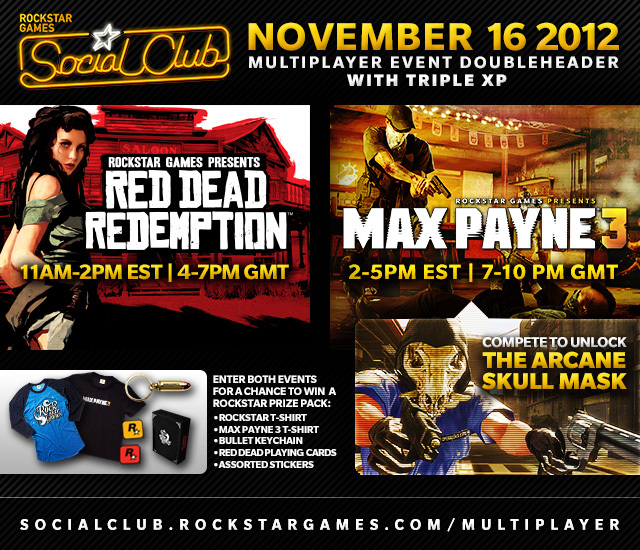 Tomorrow, November 16, 2012, from 2-5pm EST / 7-10pm GMT, Rockstar will be enabling Triple XP and playing online multiplayer with us fans. Players will have another chance to unlock the Arcane skull mask (pictured above), which is a different mask than the one that you could unlock during the Halloween multiplayer event. To join their game, just enter multiplayer and select the Social Club Multiplayer Event playlist. They'll play a mix of Soft Lock and Free Aim so look for the names listed above. You can also tune in to the action by either watching it from the Social Club, or going to Twitch. Come let us know in the forums if you're going to join.